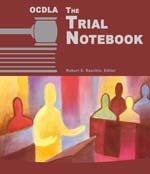 OCDLA’s 2013 edition of The Trial Notebook, edited by Robert S. Raschio, has achieved new levels of excellence. Extensive revisions to the chapters on Discovery, Jury Selection, and Closing Arguments will help you hone your skills and rule the courtroom. A new chapter on electronic evidence unravels the admissibility of email, text messages and social network data. Need to know how to subpoena an out-of-state witness? It’s in there. Want to blast the DDAs with an extensive background on prosecutorial vouching case law? It’s in there. Want the best damn discovery checklist and rundown of digital discovery basics at your fingertips? You’re covered. Want free access to case cites? Choose the PDF download containing hyperlinks to every available case, relevant statutes, the rules of evidence, and more. This edition of The Trial Notebook offers hundreds of cases, dozens of new motions, tons of resources, and will spark new, creative approaches to your case work no matter how long you’ve been in the game. The Trial Notebook works in chronological order from your initial review of the rules through discovery, to demurring, to the indictment, to preparation for and conducting the trial. It spans jury selection through post-trial motions, should they prove necessary. The Trial Notebook will become an indispensable tool in your arsenal if it is not already, and having it in court will give you a leg up on the prosecution. Electronic downloads are for members only (except law libraries) and are intended for the number of users indicated in the license. Members will need to log in to purchase downloads and get member discounts.